It’s getting hot outside and Tapped wants to make sure you have the right beer to quench your palate! It’s not always about the hops nor do you need to settle for just a light beer. How about a Wheat style beer to sip this month of June away?!?! We are kicking off this summery style with a house favorite, Lost Coast Tangerine Wheat. Lost Coast Brewery was founded 28 years ago by Barbara Groom in Eureka, California. They are not only one of the originals in California to start the craft beer movement, but also one of the few female owned and operated breweries in the country. With all of that being said, they put out some really good beer! 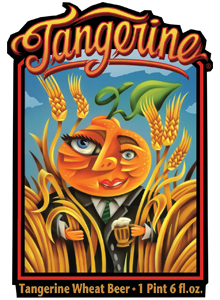 Tangerine Wheat though is a Lost Coast staple, providing a balance of tangerine and wheat. The smell gives a strong tangerine aroma with a little citrus, and the taste matches perfectly, giving you every bit of what is expected. It also bridges the gap for regular craft beer drinkers and for those testing the waters and trying to find their niche in this overwhelming craft beer world. Tangerine Wheat has been one of the few beers you will regularly see in both of our Tapped locations. For those who know how we cycle through so many different beers from different breweries, that says a lot!! We’ve carried it since day one and have found it to be common ground when trying to match beer drinkers alike. It’s good in the fall, winter, spring, and even better on those hot days of summer! There aren’t too many beers that can provide that year around comfort like Tangerine Wheat which is why it’s the obvious choice to start our month of Wheat! Make sure to stop by either Tapped location and grab a pint this week and all summer long! Come get lost with us! Next Post: Wheat! Wheat! Wheat!